Hurricanes and other natural disasters often pack severe storms with high winds. These winds, combined with flooding rains, can reap havoc on power lines and its distribution throughout the effected area. Power lines that provide safe and efficient electrical power to your home everyday can now become a silent killer. Whether the power to your house is on and functioning either during or after the hurricane passes, beware of the power lines if you venture out. In many cities, power poles are shared by utility, cable, and telephone companies. Be aware that downed electrical lines can energize these other lines as well. In fact, when everything around the effected downed lines are wet from the storm, even non-conductive materials such as pieces of wood can become a path for electricity. Metal security fences suddenly can be electrified fences and pose a death trap if you come in contact with them. Don’t forget about metal building, fences, poles, mail boxes, and standing water. These too could be an electrical hazard waiting to happen. Downed and sagging power lines offer dangers from nearby trees and branches. Wet trees can become the path to ground through you for electrical current. If you see downed power lines stay away! Don’t try to move them out of your way. Leave that to the professionals. Don’t become a statistic! The best advice I can give you is not to drive around during or immediately following a hurricane. Having said that, I know that sometimes it will be necessary for evacuation purposes and safety for you and your family must come first. 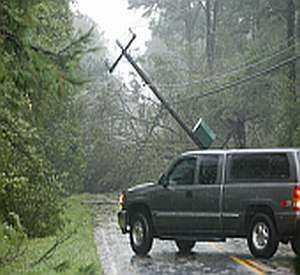 If you must drive, be watchful for downed power lines, tree limbs, and general blockages in the road. Never drive over a downed line with your car. If the car has made contact, your car could become energized. Stay in your car and roll your window down to call for help. You can also use a cell phone to dial 911. If the car has made contact and catches on fire, you have two problems. Don’t panic! You must get out of the car in this instance. The way you exit the car will determine whether you live to tell about it. Open the car’s door and stand on the floorboard of the car. Jump away from the vehicle with both feet together as far as possible. Don’t hang on to any part of the car during the jump, including the door handle. If you do, you’ll likely become the path to ground from the energized car to the street below. Remember, your car has four rubber wheels and is essentially insulated from the ground. When you just step out out the vehicle while touching it, you have completed the circuit. Although you can see that the power lines are down and the power is out, don’t think that it is safe to move a downed line. These power lines could become re-energized at any time! Never assume anything when working around power lines. Instead, assume that they are live and that electrocution dangers exist. Following a storm with a lot of wind, the area will likely be covered with tree branches and litter. Power lines have a way of getting entangled in these branches and can become a serious hazard for the person trimming the branches with his chainsaw. Litter debris can also be a hidden danger. A lawn chain, piece of metal siding, or ladder could be leaning up against a fence or tree limb that is energized. Please, please, be careful and take a good look around your surroundings before attempting any cleanup. Be sure to have someone with you in the event that you do come in contact with energized lines. That way, someone will be able to call for help.Hurricanes and other natural disasters often pack severe storms with high winds. These winds, combined with flooding rains, can reap havoc on power lines and its distribution throughout the effected area. Power lines that provide safe and efficient electrical power to your home everyday can now become a silent killer. Whether the power to your house is on and functioning either during or after the hurricane passes, beware of the power lines if you venture out.